Trying to grade as season that spanned nine months - with two distinctive 13-episode arcs featuring completely different characters - turned out to be a little bit easier than I thought. Still, Doctor Who Season 7 maintained the brilliance of previous seasons and set us up for the 50th Anniversary Episode coming in November, which is like a little candy nugget we wouldn't get otherwise. How lucky are we! Best Character: Duh. Matt Smith as The Doctor. As it happened, we actually had than one Doctor to choose from given the lead up to the anniversary and the late scene of the finale. Matt Smith, however, has so many different facets to his portrayal of The Doctor, and this season examined some of the deep dark recesses of The Doctor's mind (in "A Town Called Mercy") to the absolute giddy possibilities of being in love ("The Bells of St. John"). He can pull them all off rather flawlessly, making him my top choice for The Doctor even if I were given any choice on a silver platter. Best Episode: "Asylum of the Daleks." Everything just worked in the season premiere. The Daleks were back, Amy and Rory were shockingly in the middle of a divorce, The Doctor met Clara, who was actually a DALEK, and the Daleks chanted what got the Doctor his name after their inability to remember who he was "Doctor Who? Doctor Who?" The ultra modern take on the classic Doctor Who bad guys as Amy revealed why she was divorcing Rory while being turned into a Dalek herself helped make season opener that broke the doors wide open for anything to happen. 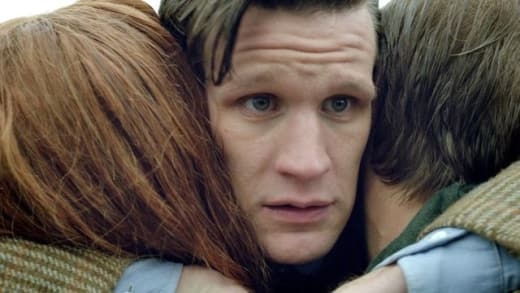 Most Shocking Development: The way Amy and Rory left the show broke my heart. It was a beautiful ending to their story in the middle of a very frightening hour, and it couldn't have happened any other way. Rory was going to die by those damned stone angels in "The Angels Take Manhattan" no matter what scenario they tried, so Amy made the decision to die with him, stay in 1938, start their lives over and publish a book letting her future family and friends know that their lives were happy and fulfilling. Tears! Worst Episode: "Nightmare in Silver." Penned by Neil Gaiman, the expectations were so high there was no place to go but down. Add in Clara's ridiculously bratty wards and a comical appearance by the Cybermen instead of even a moderate scare and it was nothing short of a disaster. May the force be with Mr. Gaiman should he write another. Most Interesting Created History: The Impossible Girl. Ever since The Doctor met Clara Oswald he was intrigued and called her The Impossible Girl. We guessed at who she might be and the theories were reincarnated love interests to a physical embodiment of the TARDIS itself. In reality, the created a spot for Clara that tossed her right into the history of The Doctor since his beginning. She has always been with him, but notoriously unseen, protecting and guiding him, sacrificing herself over and over again to ensure his safety. Whether The Doctor was surmising that when he called her The Impossible Girl we don't yet know, but I liked how it played into the historical aspect of the show and was explained by The Eleventh Doctor seeing her when others just couldn't or chose not to. Well done created history! Best Quotes: Because there were some fantastic ones along the way, a handful deserve highlights here. Play guess the episode. Make a game of it! Rory: Did you just have that on you? Brian: Of course. What sort of a man doesn't have a trowel? Put it on your Christmas list. Rory: Dad, I'm 31 years old. I don't have a Christmas list anymore. Amy: Time can be rewritten. Strax: Madame Vastra wondered if you needed any grenades. The Doctor: Human souls. Trapped like flies in the World Wide Web. Stuck forever. Crying out for help. Hopes for the Future: I can't even give hopes for Season 8 here, because we have that pesky 50th Anniversary special with the Tenth Doctor and Rose supposedly guesting, as well as the Christmas episode. So much can happen in those two, especially given the incredible reveal of David Hurt as THE DOCTOR at the end of the other best episode of the season, which was also The Biggest Bait n Switch, "The Name of the Doctor." We learned his greatest secret, which we assumed was his name, but it was actually his burial place. Tsk tsk tsk. We should know better than to fall for that stuff by now! Which is why my hope for the winter episodes and Doctor Who Season 8 are to continue on this incredibly hot streak of writing and storytelling. I'll leave the imagination and creativity up to Steven Moffat and team. Now it's your turn. Grade the season and share your reasoning and favorite and least favorite moments in the comments!